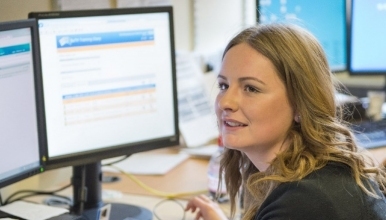 We are looking for an enthusiastic, flexible and highly motivated Apprentice to join our Complaints team here at The Royal Shrewsbury Hospital. The successful applicant must be literate, numerate and have a good understanding of computers. The main duties of the role will include liaising with the Complaints team and patients, playing an integral part in the administrative tasks for the Complaints department which includes receiving and making telephone calls, writing letters as appropriate and inputting of complaints onto Datix (computer system). The Apprenticeship Scheme is run in conjunction with a training provider to ensure that you are supported through a high quality training programme. The Apprenticeship includes the Level 2 Diploma in Business and administration, Functional Skills at Level 1 in English, Maths & IT, Employee rights and responsibilities and personal learning and thinking skills. We are looking for a motivated and committed individual who wishes to work towards a Level 2 administration Apprenticeship over a 13 month period. Whilst not guaranteed, it is hoped, the successful candidate (on completion of the apprenticeship to a satisfactory standard) would move into a substantive post within the team at a Band 2 level. Candidates must have a genuine interest in caring for people and possess GCSE’s or equivalent in: Maths & English 9-4 (A-D) and a further 3 GCSE’s or equivalent grades 9-4 (A-D) or equivalent academic qualifications. This is an ideal opportunity to become an Apprentice and you will develop new skills and knowledge whilst working within an established team gaining valuable work experience as well as a recognised apprenticeship qualification. You must take responsibility for your own learning and whilst support will be given during working hours you will be required to undertake study in your own time. Please provide information in support of your application relating to your skills, experience and knowledge. You should relate these to the essential and desirable requirements of the post. Therefore you should look at the person specification and tell us how you think you meet the criteria providing examples as necessary. The information you provide can include details of work experience, courses, hobbies, voluntary work or examples of times when you have cared for ill people or demonstrated care and compassion in your personal life. There is an eligibility criterion for government funded apprenticeships schemes that applies and therefore applicants must be 16+ and have been resident in the UK/EU for the last three years. You must not hold a qualification at the same level or higher in the same subject area or be already in any form of formal government-funded education. As members of the National Health Service you will present yourself appropriately within a professional environment. Ideally the candidates should be familiar with working with computers and possess keyboard skills. We are looking for individuals with ambition who are able to work to and achieve goals and/or objectives set by their line manager. This is a great way to get experience in the NHS and preparing you to apply for positions in the Trust, as and when they become available. The salary for apprentices from the 1st April 2018 is £3.70 per hour. This applies to 16-18 year old apprentices and those aged over 19 in the first year of their Apprenticeship. The hours for this position are 37.5 hours per week. For the initial training period the working hours will be 8.30am - 4.30pm. At the end of the training period (13 months), we will work with the successful candidates to identify appropriate, substantive opportunities (should these be available) within our team and the wider Trust. We welcome applications irrespective of age, disability, gender, sexual orientation, race or religion. Additionally, people with disabilities will be offered an interview providing they meet the minimum criteria of the post. The Trust operates job share and flexible working practices. The Shrewsbury and Telford Hospital NHS Trust is the main provider of acute medical care for half a million people in Shropshire, Telford & Wrekin and mid-Wales. Most of our services are provided at The Princess Royal Hospital in Telford and The Royal Shrewsbury Hospital in Shrewsbury.